How often do you really look at how you write? The last few months I have been fixated on increasing the word count of my short fiction. Land of Nod, completed in time for entry to this year’s Bridport Prize (I know, delusional perhaps but at least you can’t criticise me for aiming to low) was just under 4,000 words. I was good there and trimmed about a 1,000 words of unnecessary stuff. Take one of [your] longer narrative exercises — any one that went over 400 words — and cut it by half…….take any piece of narrative prose you have ever written, 400–1000 words, and do this terrible thing to it. If there’s dialogue in your piece, cut any long speech or long conversation in half just as implacably. I have never managed to do this . I’ve tried once or twice since reading the passage, but I have always been too weak. So I am going to try it with my latest piece of short fiction ‘On The Shelf,’ which I completed in first draft yesterday. I did give it a read through yesterday but I am obviously not being severe enough as I only managed to trim 147 words from a manuscript of over 3,500. I can see I will have to find the literary butcher in me to do what must be done. The hard part will obviously be stripping the piece down by 1,700 or so words while still maintaining the narrative and descriptive depth. My aim is to get the piece down to 2,000 words. I would be pleased with that. The fact that the prize I intend to enter the story for has a 2,000 word limit is a great incentive too. Just the thought of this makes me anxious. Which probably means it is a good thing to do. I may well go back to reinstate some of the trimmed darlings, but the actual process should teach me something about how I write and how I edit. Even failure should reveal something. 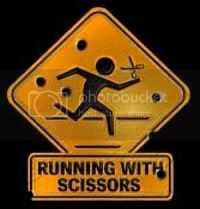 I’m off to find a really big pair of scissors. 6 Responses to A Terrible Thing To Do. Oh yes indeed, cutting is majorly difficult. You should approach it as a creative exercise though – it's remarkably liberating if you give yourself permission to slice out anything that isn't absolutely necessary to communicate the central theme of your story. Print it out and use a pen, so it's not so permanent, that makes it easier. Then when you make the cuts on the computer, if you can really justify *not* cutting something, it can go back in. It's actually good fun! Dan, I've given up on competitions – they take too much time from the 'real' writing. I know that's not the prescribed method, but I'd rather have several finished novels to offer a publisher (the count is 2 at the moment, working on a third)than several short stories going around the comps. I'm probably deluded – discuss! In two efforts recently, by recently I mean the past three months, I was faced with radically reducing the number of words. In the first I removed just over 1,000 words to get a piece below 2,500 words (a word count I had to hit). My greatest concern was that I had squeezed the life out of the story. As it turned out, I created a story that really worked, and dragged the reader along. The editor with whom I was working then showed me how to remove still more. Sheesh! The process, for me, is iterative. Print out the story. Hole up with a pen and be ruthless. Edit the document, keeping my eyes away from the word count (this I've found absolutely necessary) until all edits are made. And in the deathless phrase – wash, rinse, repeat. I'm terrified at what that process will be like for the novel I'm currently editing and the second I'm writing. I own Steering the Craft, largely because I love LeGuin's writing and I imagine she has something useful to say. Best of luck with your work. And…delusion is good, yes? That's a great offer, Jen. What might be interesting is if I sent you the original draft of 3,500 words and see what you come up with. Send me an email (via my link on the about page) from where you want me to send the draft and I'll reply with the draft. @kjm – my piece is definitely better for the trimming down. Less cluttered. Still have more to cut but well on the way now. The last two pieces I have written have used the iterative process you mention….time consuming but necessary work. Glad you have seen improvement in your work through this type of drafting.